"The Grand Old Duke of York" (also sung as The Noble Duke of York) is an English children's nursery rhyme, often performed as an action song. The Duke of the title has been argued to be a number of the holders of that office, particularly Prince Frederick, Duke of York and Albany (1763–1827) and its lyrics have become proverbial for futile action. It has a Roud Folk Song Index number of 742. There may be almost as many slight or great variations to the actions as there are groups to regularly perform them and pass on their style, but the core movements are often based upon the performers standing whenever a clear "up" is sung, reseating themselves whenever "down" is mentioned and briefly taking an abbreviated half-standing/crouching position for the "only half way up" phrase. A group of performers who, especially in an 'audience participation'-like situation, are originally seated (for example school children in an assembly, or the audience in a theatre - especially for a typical participative segment of a pantomime) will/should end the song back in their original positions. The first verse is rather gentle one to react to, with one clear standing and one clear seating action, and so other actions may be given. For example: a stiff salute for the "Duke of York", indicating "ten" by clearly displaying ten fingers (optionally emphasising this on the further syllables of "thou-sand men") and/or forming the hands/arms into a some form depicting a 'hill' summit. The second verse becomes far more rapid, especially between the two pairs"downs"
the performer may make a bob, between the two, to emphasise the separate positions, rather than just stay up/down), and synchronisation is easily lost by those who are not as quick or able to change positions, or who are new to the 'game' and not as practiced. This activity does help group-bonding in young children and encourages the following the teacher/leader of the activity, but its use is often more as an easily controlled game that promotes physical activity. As a result, the argument has been made that it may have been a common satirical verse that was adapted as appropriate and, because it was recorded in roughly the modern form, has become fixed on the Duke of York. Richard, Duke of York (1411–1460), who was defeated at the Battle of Wakefield on 30 December 1460. Richard's army, some 8,000 strong, was awaiting reinforcements at Sandal Castle in Wakefield (the castle was built on top of a Norman motte). He was surrounded by Lancastrian forces some three times that number, but chose to sally forth to fight. Richard died in a pitched battle at Wakefield Green, together with between one third and one half of his army. James II (1633–1701), formerly Duke of York, who in 1688 marched his troops to Salisbury Plain to resist the invasion from his son-in-law William of Orange, only to retreat and disperse them as his support began to evaporate. The most common attribution is to Prince Frederick, Duke of York and Albany (1763–1827), the second son of King George III and Commander-in-Chief of the British Army during the French Revolutionary Wars and the Napoleonic Wars. His one field command of significance was the Flanders Campaign of 1793–4, which resulted in the heavy defeat at the Battle of Tourcoing (1794), followed by his recall to England. Flanders having something of a reputation for being flat, the specific location of the "hill" in the nursery rhyme has been hypothesized to be the town of Cassel which is built on a hill which rises 176 metres (about 570 feet) above the otherwise flat lands of Flanders in northern France. Apart from the ducal title in the song and the events of their lives there is no external evidence to link the rhyme to any of these candidates. "The Grand Old Duke of York" is also sung to the tune of "A-Hunting We Will Go". 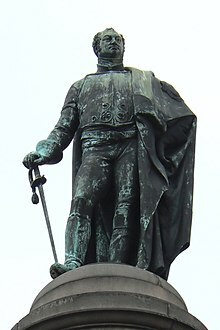 A Dutch adaptation of the song replaces the Duke of York with Maurice, Prince of Orange (1567–1625), stadtholder of six of the seven provinces of the Dutch Republic, and its most important military commander after the death of his father William the Silent in 1584. 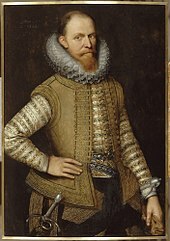 Prince Maurice was able to reconquer large parts of the Habsburg Netherlands, adding them to territory of the emergent Republic, especially during its first Ten Years (1588–98). His practice of training mercenaries (completely new, and mocked at first) and subsequent military successes became famous throughout Europe. It is not known when the British song crossed the North Sea and was attributed to Maurice, but nowadays it's well-known within the Dutch scouting movement. The song was adapted by Brazilian singer Xuxa for her circus-themed album Xuxa Só Para Baixinhos 5. In this version, the Duke of York has been replaced by a king, and his ten thousand men by ten soldiers. ^ a b c d e f I. Opie and P. Opie, The Oxford Dictionary of Nursery Rhymes (Oxford University Press, 1951, 2nd edn., 1997), pp. 442–443. ^ J. Orchard Halliwell-Phillipps and Henry Chettle, eds, Tarlton's Jests: And News Out of Purgatory (Oxford: Oxford University Press, 1844), p. xxix. ^ C. Roberts, Heavy words lightly thrown: the reason behind the rhyme (Granta, 2004), p. 44. ^ J. Black, Britain as a military power, 1688–1815 (London: Routledge, 1999), p. 195. ^ Cub Scout Songbook. Boy Scouts of America. 1955. ^ "De held prins Maurits". Scouting Marca Appoldro. Retrieved 1 September 2016. This page was last edited on 13 April 2019, at 10:00 (UTC).